I am a devout acolyte for Image Comics. All current series that I religiously purchase are published by Image. They are fun, imaginative, and engaging with their series and always excel in the realm of art. I was surprised that I’d not come across Wayward before, finding it, as one does, tucked away in a small comic shop in Umea, Sweden while on holiday. The Swede in the shop thought it was worth a read, so I took a punt on it. Wayward was at once recognisable with its tropes and set-up. It has a similar feel to Image’s The Wicked and the Divine mixed with a typical Japanese anime high school setting and folklore spirits (or at least I say anime as I’m not a manga reader, so my reference point is anime). And while I found the narrative to be rather standard fare, there’s a reason I’ve seen so many similar stories – I enjoy them. The teenage angst, the spirit lore, and the always complicated relationships the teens have with their parents. There is endless meat there for engaging stories. 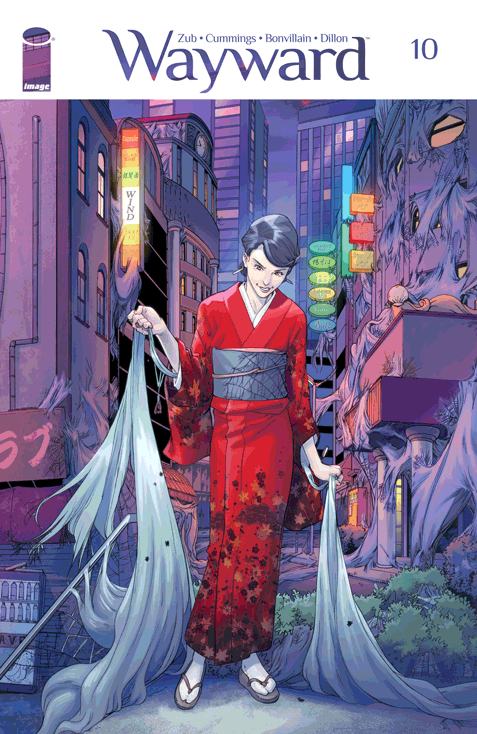 In Wayward, Rori Lane heads to Japan to reconnect with her mother following her parents’ divorce. Half Irish, half Japanese, her red hair marks her as an outsider, and to her school, a troublemaker. As Rori explores Tokyo, she discovers that her affinity for ‘joining the dots’ is something far more impressive – it’s supernatural. When accosted by a group of lecherous men, Rori meets Ayane, a brilliant fighter with a fiery temper and an uncanny connection to cats. The two of them realise that they each have supernatural abilities and begin to explore what it might all mean. Along the way, they collect a handful of other teens with special abilities and are swept up in an ancient war, order against chaos, old gods against new. Like all good ensemble cast pieces, Wayward is populated by a variety of characters, all of whom have well-defined personalities. With each new arc, the focus shifts to a different character, allowing the reader to get up close and personal with each character. What I always particularly enjoy with this kind of story is the insight they provide into another culture. 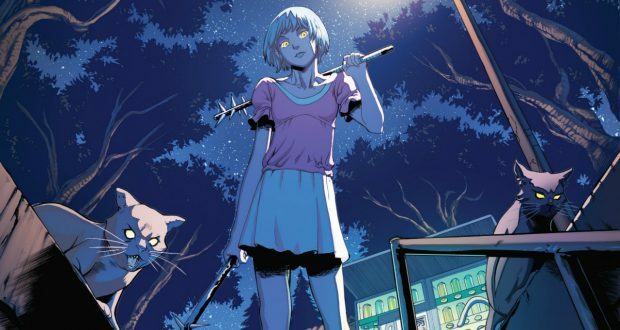 Wayward does this particularly well by giving us Rori as a focal character – a child of two cultures. But we are also given an insight into the ‘proper Japanese girl’ and the expectations of society. While many of the social constructs may be similar to those I’m well acquainted with, those that are different are all the more intriguing. One of the comic’s biggest strengths is keeping a grasp on reality by reinforcing ‘normal’ teenage responses to extraordinary circumstances – shock and horror at a friend’s gleeful violence, denial in the face of great loss, apathy regarding the inane conversation of peers, and so on. In the first three trade paperbacks, we are also introduced to two main villains, both with different powers and agendas. Their agendas are also not entirely black and white, with some of their aims being entirely understandable. When a new order is on the horizon, the old order naturally becomes a symbol of ‘evil’ – the thing to be overcome. But in their way, they simply tried to keep order. Even if they didn’t do a particularly bang-up job, is that aim something to look down on? 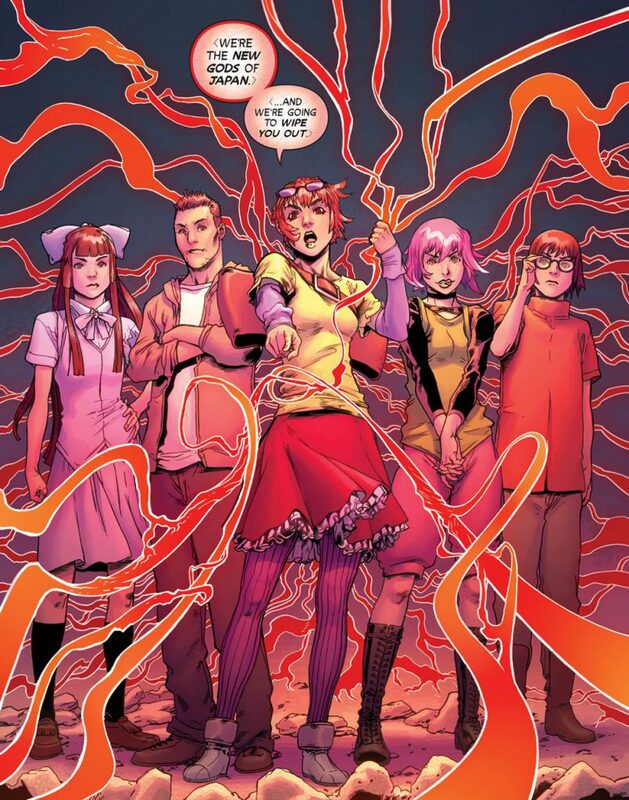 What is even better with Wayward is that the protagonists, these kids who have newly come into power, have no idea about the politics happening around them. This adds a layer of depth to the world and the narrative, suggesting a good deal of payoff for investing in the narrative over the long term. I need to give Steven Cummings a proper shout out. 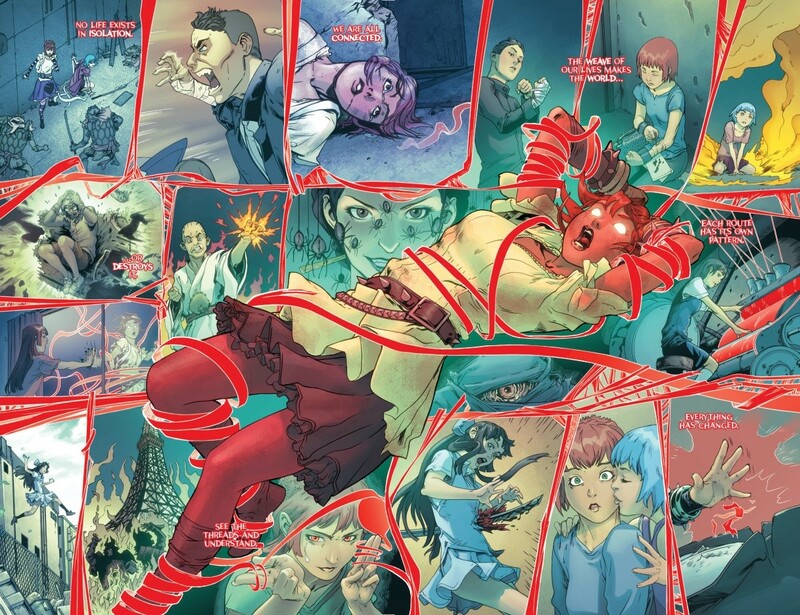 Like the other Image comics I love, it is the art that pulls Wayward together. 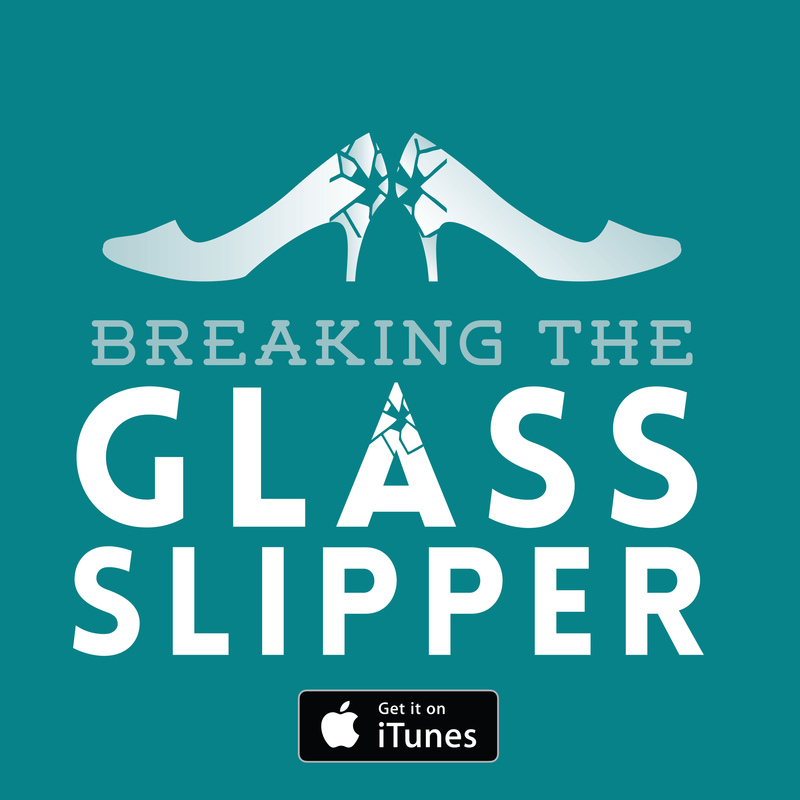 I love crisp art – clear lines and artistic detail specific to an artist or series. Cummings delivers on this in spades. He creates a Tokyo full of personality and life, blending together the natural and supernatural elements seamlessly. Every time a particular tone is required, Cummings nails it. The monster design is inventive, culturally reflective, and fun. Top marks on the artistic front! Verdict: A solid entry from Image, though all elements are familiar in one way or another. Worth reading, though unlikely to be a must-read.